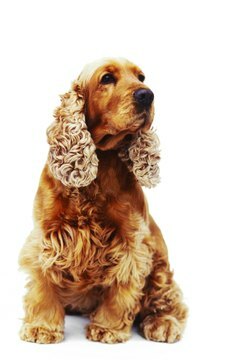 Cocker spaniels have unique and beautiful coats that need dedicated grooming. You could take your pet to a professional groomer for a fancy haircut or you could just give your cocker a haircut at home. Pet trims are easy to do and can be completed with minimal equipment. Use a slicker brush to gently brush your cocker spaniel's hair. It is very important to detangle the hair prior to a haircut. A detangling spray that has been formulated especially for dogs can also be used to further relax the hair and make it easier to brush. Use a double-sided comb or a dematting tool to tease mats from the hair. As a last resort, difficult mats can be cut away with a pair of grooming shears. Do not use shears around the eyes or other sensitive areas -- this tricky task should be done by a professional groomer. Lift your cocker spaniel onto a sturdy table. As with any salon project, it is easier for the beautician to perform the haircut from a standing position. If your pet is too frisky to hold still (or a daredevil jumper), you should skip this step and trim your pet while you are both sitting on the floor. Use a pair of sharp grooming shears to trim the hair on your pet's head. You can use a comb to lift the hair and the shears to remove it. Keep the comb between your pet and the shears. This will be safer for your pet and will help even the most inexperienced beautician keep the cut even. Remember, do not risk injury to your pet by using the shears near her eyes or other sensitive areas. Use the grooming shears to trim the hair on your pet's back, legs, and feet. Shears can also be used to trim and shape the feathered hair that hangs from your dog's sides so that your cocker doesn't look like she's wearing a hairy tutu. Try to do one section at a time so that you do not get overwhelmed. Finish off by using grooming shears to trim any stray hairs around the body. Afterward, you may want to consider bathing your cocker spaniel to wash away any loose hairs and conclude her day of beauty! Cocker spaniels should have a daily brushing routine. This will help prevent matting and tangles -- both of which can make grooming uncomfortable for you and your pet. You can cut your cocker's hair very short for easier maintenance or leave it longer -- the choice is yours. You may need to give your cocker spaniel occasional breaks throughout the process. Cockers have beautiful hair, but rarely have the patience to sit for long periods -- unless they are being petted or fed treats, of course! Take your cocker spaniel to a professional groomer for a haircut that involves clippers, unless you are an expert. Your pet could easily be injured if you do not have the right equipment, or if you accidentally come too close to the skin while cutting or clipping the hair. How Much Food Should a Cocker Spaniel Puppy Be Fed? Does a Pekingese Need a Haircut?